Landowners David Stone and Carolyn Taormina had a dream of owning and stewarding a special piece of land they found. The amazing property has 1/3 mile of intact river frontage along the East Fork Illinois River and riparian habitat along Cedar Gulch. The land was at risk of being sold and potentially clear cut. With the fundraising help of neighbors and Takilma community members, David and Carolyn were able to purchase the property (read backstory below). The property is now protected forever with a conservation easement held by SOLC. The sensitive riparian areas will be conserved for the benefit of the fish and wildlife species that thrive on the land, as well as the people who care for the land. The property is nearby a 259 acre conservation easement held by SOLC, located in our Upper Illinois River Focus Area, which also includes an additional 678 acres of conserved lands, and near the Rogue-Siskiyou National Forest and a BLM botanical area. SOLC is excited to add this easement to our family of 66 conserved properties, adding 80 acres to SOLC’s 10,404 acres of protected lands. 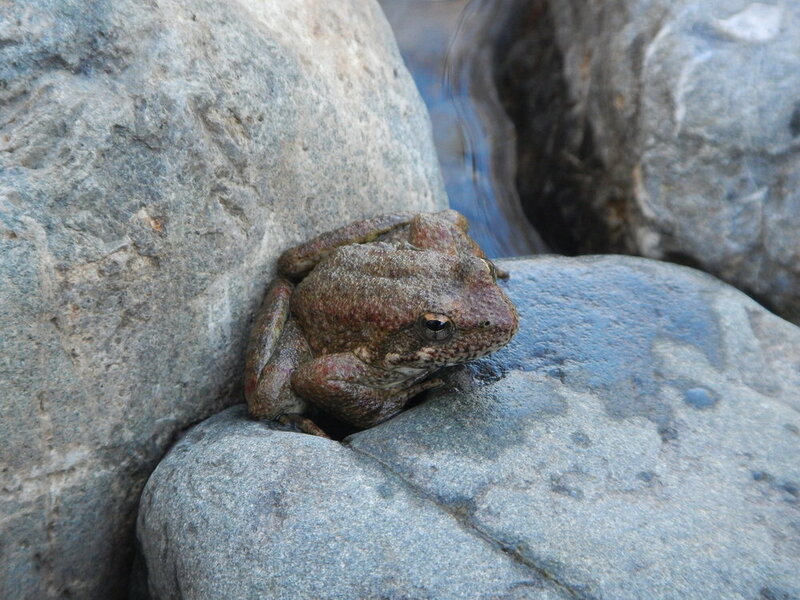 Yellow-legged frog rests creek side. you for supporting conservation in our region! Editors Note: The following article about how David and Carolyn became the landowners of this outstanding land first appeared in SOLC’s 2016 Winter newsletter. The Southern Oregon Land Conservancy and community members from Takilma, a small rural town located ten miles south of Cave Junction, share a dream: that someday the 255 acres now protected along the East Fork of the Illinois River will expand to include many more hundreds of acres. A piece of that dream moved closer to reality recently when a dedicated and passionate group of neighbors resolved to do the impossible. With their hearts and their pocketbooks, Takilma residents rescued a beautiful and beloved property from an imminent clearcut and into the embrace of committed conservationists and interested buyers, David Stone and Carolyn Taormina. It has meant more than anyone can imagine to save a piece of land for keeps, for the wild. In 2014, an 80-acre parcel of land known as the Circle S Ranch, went up for sale at an asking price within reach of David and Carolyn. Sometime later the price increased by more than $100,000, reflecting the value of timber following a timber cruise. With the purchase price now beyond the means of David and Carolyn, the land was at risk of being sold and clear cut. But Takilma neighbors envisioned a different outcome. “When I felt the stone in the pit of my stomach, I knew I had to do something,” recounted nearby landowner Beth Peterson. Beth, along with help of other neighbors, decided to attempt to raise the $100,000+ needed to make up the difference so that Carolyn & David could purchase the land and safeguard it in perpetuity. Their only condition was that Carolyn & David commit to placing a conservation easement on the land, which they willingly agreed to do. “It has meant more than anyone can imagine to save a piece of land for keeps, for the wild,” said Carolyn. “We are very grateful, every day.” The property abounds in wildlife and is known to be the home of the Northern spotted owl, several species of salmon including coho, Chinook and steelhead. Many species of trees including Port-Orford cedar, white oak, madrone and Pacific yew abound in the area. “There is so much more that goes unseen by human eyes. As it should be,” said Carolyn. In the end, close to 30 community members stepped up and gave gifts ranging from $50 to $10,000. Carolyn and David were able to purchase the land and are currently in the process of setting up a conservation easement with us. And the neighbors? Peace of mind is all they wanted and now have, knowing that a beautiful stretch of the East Fork of the Illinois River, along with its sensitive forest and riparian habitat, will be protected...and the dream of conserving a big swath along the East Fork region is closer to reality.